Whisky matures only in the cask, not the bottle, and the cask in which the whisky matures makes a huge contribution to the flavor, aroma and color of the matured whisky. In fact, casks are responsible for 60 to 70 % of the whisky's ultimate flavor. In this article, we will take an in-depth look at different types of casks and their wood characteristics, the process and science of whisky aging, and how scotch and bourbon get their various flavors, aromas and color from the casks used during aging. Several processes take place during aging and besides the casks the surrounding environment plays an important role in the ultimate flavors acquired by the whisky. Aging an alcoholic product like whisky is dependent on three important elements—time, aging container and a few essential chemical reactions between the liquid, air and container. These three elements influence the character of the whisky and give it its distinct flavor profile. Wood is semi-porous and will expand on warmer days and contract on colder days, and as weather changes throughout the year the expansion and contraction of wood will result in spirit flavors being exhaled and natural aromas of the surrounding being drawn into the cask. Some of these surrounding characteristics include piny, heather and salty aromas from the sea air. Flavors are imparted by the type of the cask used for maturation: sherry casks will add dark fruit notes while bourbon barrels impart caramel flavors, vanillins and tannins. Occasionally Port wine barrels and rum casks are also used to add different flavors to the whisky. During aging the alcohol in the whisky is constantly interacting and drawing flavors from its container. 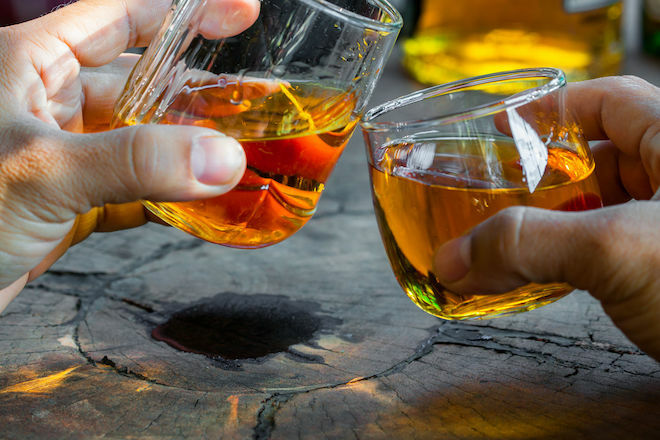 This interaction is also dependent on the climate of the region, as whiskies produced in the warmer climate of Taiwan such as from Kavalan, tend to draw flavors quicker from the casks as compared to a scotch aged in the cooler climate of Scotland. During aging a certain percentage of alcohol and water evaporate from the cask each year, which is called 'the angels share' and this percentage depends on the climate of the region where the whisky is matured. 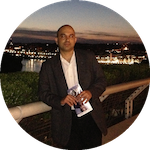 A higher proportion of the liquid is lost to evaporation during aging in warmer climate as compared to aging in cooler climate. The process of aging also reduces the alcohol content of whisky, while gaining smoothness and complexity of flavors. 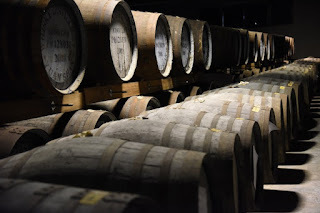 The aging period can vary from region to region and therefore the influence of the cask on the whisky also changes based on the region where it is matured. To understand the oak compounds that are released during the aging process and its influence on the whisky flavor, it is important to know the interesting science of tree growth and the different types of oak grain. 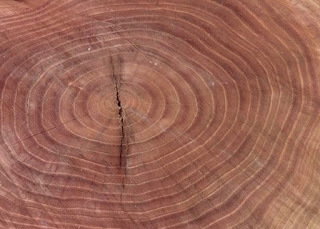 Grain is defined as the average width between the annual growth rings of the tree. Trees grow outward, from the core out to the bark, adding a layer every year just under the bark. This incremental layer is called the 'annual growth ring'. Only the trees that grow in the temperate zone which have distinct winters and summers have distinguishable growth rings. Each growth ring is divided into two types of wood—early wood and late wood. Early wood which has a lighter color occurs during the spring season of each year and late wood occurs during the summer season. One year of growth is therefore represented by a ring consisting of a light part and a dark part. 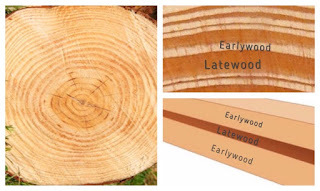 Late wood contains more cellulose and less lignin that early wood. Lignin is the organic substance that produces vanillin. Vessels in spring wood are numerous and wider than in summer wood. This is because spring is when the tree starts pumping the sap up its trunk to form the buds and leaves. Then, in summer, the leaves use the sun for photosynthesis to produce sugars which are stored in the tree’s cells. Summer wood therefore has a higher density of cells and fewer vessels. The width of each growth ring varies due to the tree's growing conditions: climate (rain and sun), soil, nearby tree population and terrain. These growing conditions generally have a larger effect on the late wood. 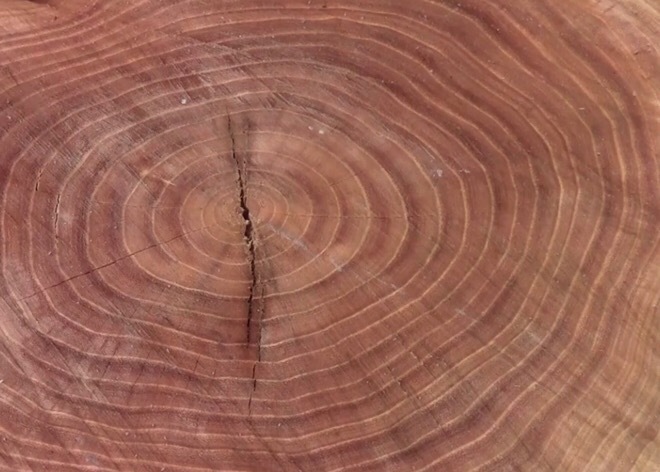 This variable thickness of growth ring defines the grain type as tight grain or open grain. Tight grain has more early wood and open grain has more late wood. The fact that tight grain has more vessels due to the larger proportion of early wood means it is more porous and goes against the popular belief that open grain is more porous—it is the opposite. Grain is generally considered tight if there are 4 to 5 rings per cm or if the rings are narrower than 2 or 3 mm. Trees growing in dry areas, on poor soil and with a high nearby tree population tend to have tight grains. But the grain also varies through the life of the same tree, as older trees grow slower and hence have tighter grain. Similarly the grain at the foot of the tree will be wider than at the top. Tight grain is more aromatic as more aromas are released from the vessels, which carry the sap known to be rich in minerals, nutrients and sugars. Open grain is dense and more tannic due to the larger proportion of late wood. Since porosity is higher for tight grain it allows the whisky to have more interaction with the wood during aging. Whisky aging barrels are constructed using oak planks or staves, and the type of wood grain of these planks will therefore influence the color, aroma and taste of the whisky during aging. Historically any type of wood would be used to make the casks, but after years of experimentation and discovering the importance of oak and its characteristics, casks are made from white oak. White oak is selected for its toughness yet can be bent by heat without splitting, has a tight grain that prevents leaking but also porous to allow oxygen in and out of the cask. Additionally, white oak has its pores plugged with a substance called tyloses, which helps make white oak suitable for water-tight containers with an increased resistance to rot and decay. The type of oak can vary from American, European or Japanese and each has their own characteristics and influence on the aging process. 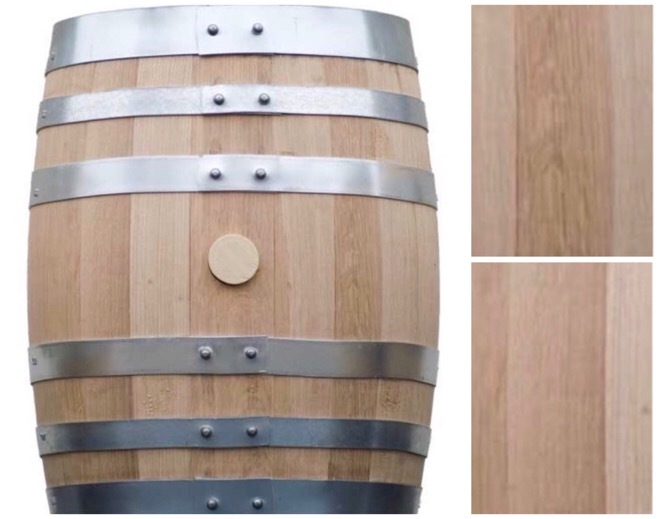 The species of oak typically used for American oak barrel production is the Quercus alba which is a white oak species that is characterized by its aromas and lower wood tannins. American oak has more pronounced aroma than European oak, high levels of vanillins and imparts flavors and aromas at a higher intensity, but mellows sooner. American oak also has a higher proportion of oak lactones which are responsible for the woody character and coconut aromatics. American oak is the most widely used oak for whisky maturation in the world. Bourbon by law must be aged in American oak barrel. 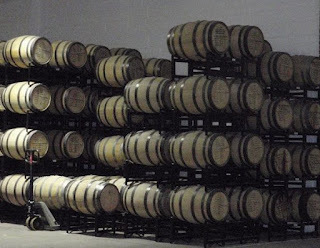 Outside of the United States, American oak barrels are cheap having been already used by law to mature bourbon. The species of oak typically used for European oak production is the Quercus robur or petraea. Quercus petraea is usually tight grained (about 1mm) and has less tannins than Quercus robur and Quercus alba which usually have coarser grains of about 3mm or less depending on the region where it is grown. Quercus petraea when compared to robur is considered superior for its finer grain and richer contribution of aromatic and flavor components like vanillin. It also allows for a more gradual integration of flavors in the whisky. The region of growth and forest conditions also determines the characteristics of the oak. The hemicellulose in the Hungarian oak breaks down more easily and imparts toasted, vanilla, caramel, woody, spicy flavor notes during aging. Hungarian oak also imparts these aromas with less intensity, and slower than American or French oak. Scotch can be aged in American and European oak. Also known as mizunara oak, this type of wood is mainly used in the Japanese whisky industry for finishing the whisky after it has been aged in bourbon or sherry casks. The wood from mizunara oak has high levels of vanillins, coconut aroma and unique set of flavors. It is porous and allows whisky to absorb more flavors from the wood, but very prone to leaks and damage so it is only used for a short maturation period. Seasoning is the process of naturally drying the raw wood in open air for 18 to 60 months. Open air seasoning reduces the moisture in the wood, softens the bitter tannins, while also removing some of the less desirable components like sap, mellowing the oak in the process. Though kilns can be used to speed up the process, it is believed that only natural seasoning delivers the best aromatic profile with the softest level of tannins. European oak, grown in a more temperate climate than American oak requires longer seasoning period due to its higher level of tannins. As tannins soften with seasoning they also add a smoother feel to the whisky during aging. During barrel production, the insides of barrels are typically toasted or charred. The major constituents of oak besides tannins are cellulose, hemicellulose, lignin and oak lactones which applies mainly to American white oak. Each of these constituents are modified by the toasting and charring process, creating aromas and flavors that influence the whisky matured in the barrel. Toasting helps caramelize the sugars from the hemicellulose in the wood, releases vanillins from lignin, softens the harsher tannins in the wood and also changes the barrel flavors to more spicy, toasty, vanilla notes. Toasting can vary from a light toast to a heavy toast which also changes the strength of the flavor and aroma compounds imparted during aging. Essentially, the heavier the toast, the stronger the barrel’s flavors. Charred American oak barrels are used for making bourbon. The barrels must be charred to around 1/8 of an inch to make bourbon. Charred barrels impart a darker color, as well as sweet flavors like caramel and honey, besides smoky and spice notes to the bourbon. Additionally charred wood, acts like an activated-carbon filter, which can help remove sulfur compounds from the bourbon, and make a smoother drink. Charred barrels also provide a passage for the aging spirit into the pores of the uncharred oak, thereby drawing wood aromas and flavors. 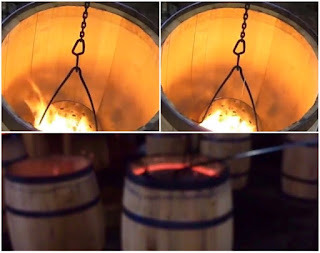 Many distilleries around the world are constantly conducting experimentation with different types of casks and charring techniques on the oak barrels for maturing their whisky. Spanish sherry casks are frequently used to mature whisky for a short period of time after aging in oak barrels. Whisky aged in oak barrels and finished in sherry casks can add a sweet dried fruit flavor and smoothness to the whisky. Portuguese Port casks and French sauternes casks are also used as an alternative for adding multiple layers of flavors to the whisky. Laphroaig PX cask a single malt scotch whisky uses three types of barrels in the maturation process. The whisky is aged initially in American oak and then in quarter casks before finishing in ex-PX sherry casks. Pedro Ximenez sherry casks, referred to as 'PX' casks provides a rich, sweeter and full bodied notes to the whisky, from its previous use in sherry aging. Quarter casks which are of smaller size, provides increased contact with the oak, adding a soft and velvety touch that complement's Laphroaig's distinctive peatiness. 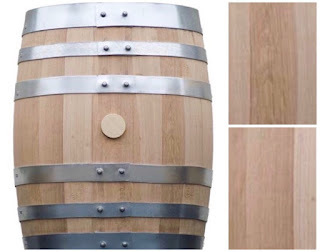 Hybrid barrels are made from multiple types of wood and it offers distillers the ability to combine the different characteristic of American and European oak to add different flavors to the whisky during aging. Since a barrel is made from a number of staves of different sizes, hybrid barrels allow the distillers to combine multiple wood types in a single barrel. Amrut Spectrum an Indian single malt whisky uses a barrel with five different types of wood for maturation after first aging in ex-bourbon barrels. The hybrid barrel is a mix of new American Oak, new French Oak, new Spanish Oak, ex-PX sherry cask stave & ex-Olorosso sherry cask stave which imparts a complex range of different flavors to the whisky. 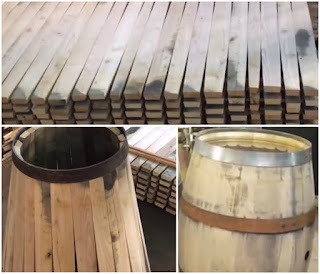 Maker's Mark distillery also has an offering called Private Select where participants can create their own flavor profile by selecting among five different types of oak staves to build a barrel for finishing a fully matured Maker's Mark whiskey. Cask Strength is a true reflection of the influence of the cask in the complex flavors that have been acquired by the whisky during the aging process. Cask Strength does not refer to any single process but rather what has been done to it as a result of aging in the cask. Most whiskies are brought down to a standard percentage of alcohol by volume, or proof, by the addition of water before bottling so that each batch is consistent. However, a cask strength whisky is bottled at the strength at which it's drawn from the cask—nothing is artificially added, and nothing is taken away—with only the natural influence of the cask on the ultimate flavors and lowering of alcohol by evaporation.